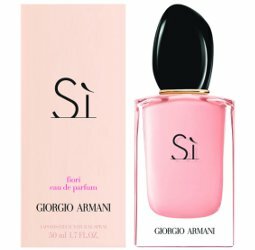 Giorgio Armani has launched Sì Fiori, a new fragrance for women. Sì Fiori is a flanker to 2013's Armani Sì. Sì Fiori was developed by perfumer Julie Massé, and 'reinterprets the chypre theme' of the original around neroli. Additional notes include green mandarin, blackcurrant, vanilla and white musk. Giorgio Armani Sì Fiori is available in 30, 50 and 100 ml Eau de Parfum. looks like designer Pepto Bismol. is that the juice color or just the bottle? I don’t know, and I have seen other images that don’t look quite *that* shade…hard to say if it is accurate or not. Yeah the fragrantica picture is a much lighter shade. Guess I’ll have to peek in person next Sephora visit.